Just when you thought LED technology was at its best with the Multi Zone Kits, here comes a cool new addition: the WiFi Controller for RF Multi Zone kits from LED Strip Canada. You can now control all your Multi Zone setups using your smart phone or tablet. All you have to do is install this USB powered WiFi Controller, connect it to your internet setup or home network and download the free MiLight iPhone/Android App. You will never want to go back! Note that the WiFi Controller for RF Multi Zone kits is compatible ONLY with our Multi Zone products (Multi Zone LED Bulbs and Multi-Zone controllers for LED Strips). This smartphone/tablet application is a digital rendition of the Multi Zone remotes. It allows you to control your Multi Zone setups just as you would with your Multi Zone remotes. It is compatible with iOS 5 and up / Android 2.1 and up*. You can find the MiLight app on the Apple App Store or Android Google Play and download it for FREE. Once properly installed (as explained below), it will become a part of your home network and won’t require you to create a different network just to use this specific product. *Please note that the current version of the Milight App on Android doesnt allow the cool/warm white color changing option on the Single Color Digital Remote, but the IPhone/IPad app does. You can control the following Multi Zone items. For more information about the Multi Zone setups, please read the descriptions for the RF Multi Zone RGB LED Strips Kit and the RF Multi Zone Single Color LED Strips Kit. Installing your WiFi Controller and setting up the App. Here’s what to do to set up your new WiFi Multi Zone system! Supply power to the WiFi controller box with a USB DC5V 500mA power supply (a USB phone charger should do the trick) or simply connect it to your computer’s USB port (note that if you plug it into a computer, the computer will have to remain turned on for the controller to stay powered). The power indicator will flash. If your WiFi controller is new, ignore this current #3 section. If the controller has previously been assigned, you need to revert to factory default settings before going any further. To do so, use a mini screwdriver, paper clip or thin solid string to long press the “RST” key on the controller box (inside the tiny hole) for 10 seconds until the 2 indicators flash. Go to the WiFi settings of your Android or Apple iOs smart phone or tablet and connect it to the newly appeared “milight” network. The link indicator on your WiFi controller box will light up when the connection is established. In your MiLight app, you should see the “milight” device appear in the Device List (if you don’t, hit the refresh button at the top right, or restart the app, or reboot your phone/tablet). Press on it. You can change the name of the device if you want. Confirm the name. Press on it again to finish the initial setup. Choose the “Configuration” section at the bottom right of the screen then click on “WiFi Setting”. The app will scan the available networks and list them. Choose your home network or internet network and enter the password. This will connect your controller box to your network. The app will ask you “Do you want to switch the device to STA and restart it”, press OK.
Go back to the “Device List”, wait a little bit and then press the refresh button at the top right. Select your device and you are now taken into the “Select Monitor” section to choose your remote interface. For your RGB Multi Zone kits, select the colored remote with the “M” in the center of the middle round button. For your Single Color Multi Zone kits, select the remote that is completely gray (a few colors appear when you press on buttons). To edit your device name and picture, press on the “Information” button at the bottom center. Your remote app is now properly set up!! Control your Multi Zone lighting setup from somewhere else. Let’s say you’ve got a RF Multi Zone setup at home and you forgot all the lights on when you left for work in the morning, well there’s still a way to turn them off. With the WiFi Controller for RF Multi Zone kits, you can operate your lights from afar. If your home network (to which your WiFi controller is connected) is an internet connection, the controller box can be operated via the internet. Make sure your smart phone / tablet is connected to the internet and open the MiLight app. 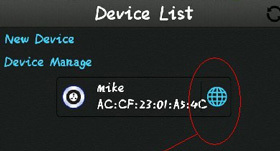 In the device list, you should see a blue globe beside your device name; this means it’s accessible via internet. Press on it and you can now control your Multi Zone lights as if you were at home. • It is important that you choose the right virtual remote while using the app or your setup will not work properly. Please refer to section 9 of the “How to install” section above for details. • Note that the WiFi Controller for RF Multi Zone kits is compatible with all our Multi Zone products but we strongly suggest getting a Multi Zone remote regardless. You don’t want to be stuck with blinking red lights because your network is down or your smart phone’s battery is dead. • If you plug your controller box into a computer for power, the computer will have to remain turned on for the controller to stay powered. • Keep in mind that this product relies on the network it’s connected to. If you encounter any problem operating your Multi Zone setup with the WiFi Controller, be patient and make sure you verify your network’s behaviour.